Do You Keep Your Jamie Cullum Tickets? HomeBlog PostDo You Keep Your Old Jamie Cullum Gig Tickets? Do You Keep Your Old Jamie Cullum Gig Tickets? 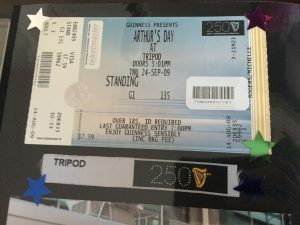 When I was in my teenage years I used to save all my gig tickets (usually Boyzone tickets). I would stick them on my bedroom wall. Similarly, as I got older (by older I mean from my mid-twenties 🙂 ) and became a fan of Jamie and started attending his gigs regularly, I began saving my Jamie Cullum tickets. Some of them are from great locations America, Germany, Oslo etc. I put them in a photo album along with any photos of the night I had taken, saving the memories of a fabulous show and a reminder of the great new friends I’d met. I would look forward to doing this, for me it was a nice way to relive a great night. Over the past few years, I have spent less time doing this. So more often than not my tickets end up in my bedside drawer with a promise they will one day take their rightful place alongside all the others. Nowadays a lot of gig tickets are paper-based or can be scanned from your phone. So this got me thinking. What do you all do with your gig tickets? Are they in an album, on a wall, part of an art piece, used as a bookmark? or maybe you don’t do anything. I would love to hear your thoughts and perhaps your ideas will give me and other fans some inspirational ideas. Every piece of memorabilia is kept safe, either in my gig book (tickets and wrist bands), whilst posters etc are under the bed or in my memory box, ( which holds many special things). I’ve seen you photo album and thought what a great idea, but for some reason, I can’t do that, I like to keep everything together, hence the elastic bands around my gig book! The real question is, what do our favourite music as do with the fan stuff? Maybe you could do a survey……. I always save my gig tickets, 30 years worth now.. I used to file them in a display binder but in the past 10 years or so that has gone by the wayside, they are all in a compartment at the bottom of my wardrobe along with a batch of programs. Etickets would just break my heart.